The people who work with Outlook are familiar with the OST file. It is an acronym used for Offline Storage Table that allows users to work in an offline mode. However, many people reported the error that they cannot access OST file in Outlook application. And, due to which they become unable to work properly. After a deep research, we find out there are multiple reasons that responsible for this OST file error. Therefore, in this write-up, we are going to show different workarounds that can be used at the time when unable to access Outlook OST file in the Microsoft Outlook program. So, let’s get started! There are various situations due to which Offline Storage Table file cannot be recognized by MS Outlook. The following are the factors mentioned below through which users unable to access Outlook OST File email application. Poor Connection: It might be possible that due to sluggish or no internet connection creates a synchronization problem between the Exchange Server and Outlook file. As a result, user unable to access Outlook OST file Microsoft Outlook. Unapproved Access: Any unauthorized access to Offline Storage File can make .ost unapproachable to authenticate the user. Synchronization Issue: During the synchronization of OST file, if the running sync process gets disturbed like power failure, then Exchange OST file turns to be corrupt. Harmful Extensions: Non-essential Add-ins installation in Outlook can also make Exchange data file inaccessible. Virus Attack: There are a number of viruses that damage the Exchange OST file severely. As a result, the users become unable to access it. Due to this, the user has to face cannot access OST file in outlook issue. After understanding the different scenarios, let’s check out the solutions of it. In the following section, readers will explore various troubleshooting methods that can radically repair this error. One can only require to go through these solutions carefully. 1. Close the Outlook program. 2. After that, open Task Manager window on the system. 3. Next, navigate to Processes tab and find programs like Lync, UCMAPI. 4. Finally, select the individual task and click on End Task. 1. Launch Microsoft Outlook application. 2. Click on File tab and select Options >> Add-ins. 3. In the following window, select COM Add-in and click on Go button under the Manage section. 4. Now, disconnect the irrelevant Outlook add-ins. The compatibility mode is used to help an application to execute on an older OS. In such a situation when Outlook is running in compatibility mode, then make it disable and check whether the problem is resolved or not. Adding to it, Microsoft Outlook does not use this mode. To turn off the compatibility mode, use the below to solve cannot access OST file in Outlook problem. 1. First, search the Outlook.exe file on your system. 2. After that, right-click on the Outlook.exe file. 3. Now, select Properties >> Compatibility tab. 4. Now, if any of the checkboxes are selected under the Compatibility tab, then deselect it. 5. Select Apply >> OK and again start the Outlook program. SCANOST.EXE is an inbuilt utility provided by Microsoft in Outlook 2007 version only. It is used to repair Exchange OST file from the minor corruption. Follow the mentioned steps below to solve Cannot access OST file in Outlook Issue. 1. Initially, locate the following path on File Explorer bar. Navigate to SCANOST.EXE and double-click on it. 2. After that, select that OST file that you want to repair. 3. Now, check the box labeled as Repair errors. 4. Finally, click on Begin Scan to initiate the process. After using the above workarounds, still, the users unable to access Outlook OST file in Outlook. Then, it probably is the case of major corruption in the .ost data file. To resolve this problem, take the help of powerful and efficient OST to PST Converter Tool. This software function is to repair the majorly corrupted OST file and convert them into a healthy one. Also, it supports data recovery of S/MIME (Secure/Multipurpose Internet Mail Extensions) or OpenPGP encrypted OST file. For this, users need to upload the OST file in the tool and then either select Single Key or Multiple Key options. After that, locate the keys and repair the file. Once the file gets recovered, export them into another file format such as PST, MSG, EML, HTML. If users wish to import the recovered file directly into Office 365, then it can be done easily with this utility. The best part about the software is it supports Outlook 2019, 2016, 2013, 2010 or below editions. Moreover, it is the safest and one sure shot solution that can repair the file and user can easily access the OST file in Outlook application. There are numerous Outlook users who reported on the technical forum that OST file becomes inaccessible. 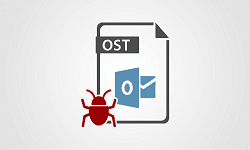 Therefore, in this post, we have explained all the possible methods that can fix ‘Cannot access my OST file in Outlook 2010 / 2013 / 2016’ issue. If the error occurs due to corruption in OST file, then do not waste your precious time and directly use OST to PST software. It repairs the highly corrupted encrypted Offline Storage File in the least time utilization.